Creates a feature class containing polygons, each of which represents the envelope of an input feature. Since the envelope of a perfectly horizontal line (parallel to the x-axis) has a zero height and the envelope of a perfectly vertical line (parallel to the y-axis) has a zero width, the resulting polygon from either line would have a zero area; such invalid polygons will be omitted in the output. The same applies to a part in a multipart line feature. The output polygon feature class. Specifies whether to use one envelope for each entire multipart feature or one envelope per part of a multipart feature. This parameter will affect the results of multipart input features only. SINGLEPART —Uses one envelope containing an entire multipart feature; therefore, the resulting polygon will be singlepart. This is the default. 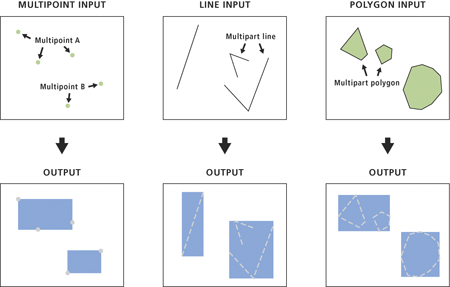 MULTIPART — Uses one envelope for each part of a multipart feature; the resulting polygon of the multipart feature will remain multipart. The following Python window script demonstrates how to use the FeatureEnvelopeToPolygon function in immediate mode. The following stand-alone script is a simple example of how to apply the FeatureEnvelopeToPolygon function in a scripting environment. #              the general extent of features.